This is an interesting first shot. 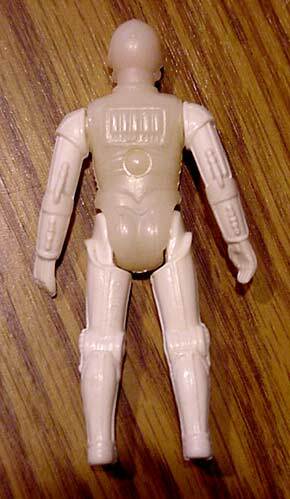 �It appears that the torso and head are made of a similar hard plastic used for the production C3PO, although this one has obviously not yet been metallized. 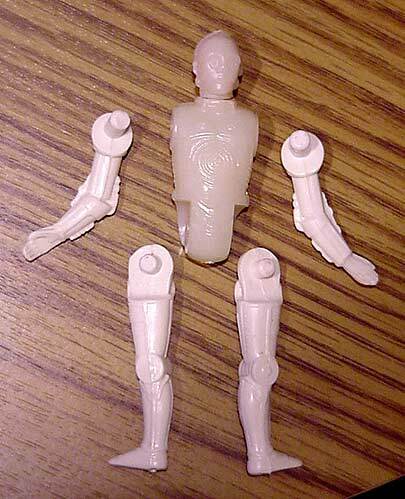 The limbs of this figure are actually made of a softer plastic, similar to that used on most of the other action figures. 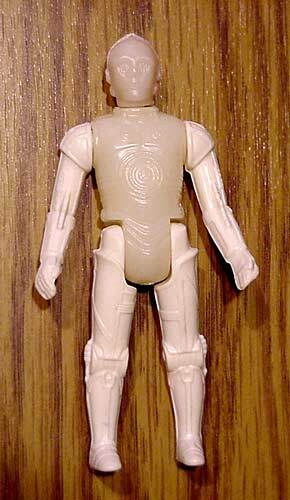 While other C3PO�(removable limbs) first shots are known to have the original 1977 date on the leg, this one reflects the change to 1982 that was in the final mold. The torso of this first shot is sonic welded and the head is not removeable. Some first shots and, of course, production C3POs would have had a seperate part resembling a rivet or a screw holding the torso halves together. �This one looks similar at first glance, but the "screw" actually molded into the design of the back.